After we got home, the question lingered. If I was honest, I had stopped caring. I no longer made sure my shirts looked good on me, rarely ironed them, wore jeans that were too tight around my awkwardly large middle. If I was truthful with myself, my self-confidence was also buried under there, too, and I acted like nothing regarding my style, let alone my weight, mattered. In the 17 years since our wedding day, I had gone from 130 pounds to 230 pounds on a small frame. Her question probably saved my life, because it started me on a journey. The journey began with me spending that night determining a style of clothing and “look” that I wanted to dress in, and then finding clothes at the thrift shop sales over Labor Day weekend that actually fit. Admitting I needed large shirts, pants sized 36, and other painful realities wasn’t easy. But suddenly I felt better about myself because I looked better. And, because I finally liked how I looked in the mirror with my clothes on, I could be honest and say I really hated how I looked with them off. Sure, most people may not have noticed, since all my extra weight was carried right in my front, and I didn’t look “fat.” But I was obese. My BMI was nearly 40, and a healthy weight for someone of my height was far less than what I weighed. My family has a history of high blood pressure, sugar diabetes, and a host of other weight-related issues that hit in their 40’s, and I was headed that same direction. So, it was time to not only look good, but feel good and be healthy. 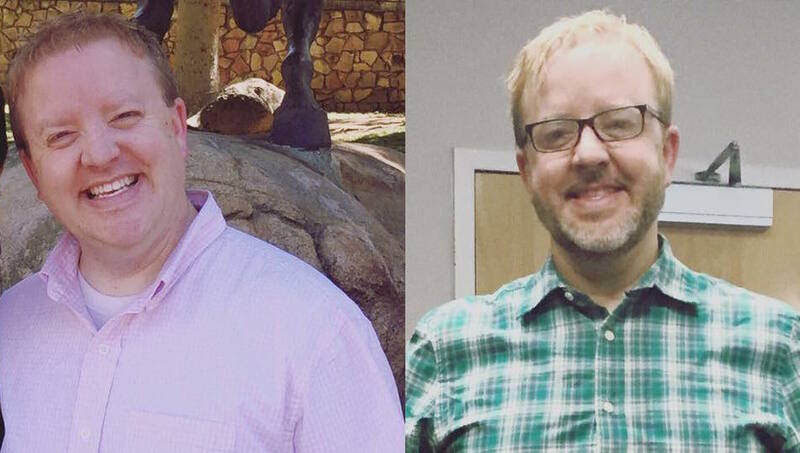 In the last six months, I’ve lost 75 pounds. I now weigh around 145 pounds, and I’m still shooting for weighing what I did on my wedding day. At 46 years old, I’m in the best shape of my life, and I feel excited about my future because I have finally care. As I’ve shared my story, I’ve had people ask what my secret is. How have I done it? How does a guy who hated P.E. in school find the motivation and determination to lose what amounts to the weight of a small child? It’s not easy, and you can’t just take a magic pill to make it happen. Here are 5 Things You Can Do Today To Begin Losing Weight. 1. START CARING. If you don’t care, you’ll never make the decision to change. This is true in every aspect of your life: work, family, marriage, health. Ask yourself that hard question: Do you even care? If the answer is no, ask yourself why. Have you accepted that the way things are are the way they must always be? Have situations in your marriage or family or job caused you resign yourself to the status quo? When I realized that I had stopped caring, I realized an even more fundamental truth: I actually did care. I did care about what my wife thought of my appearance. I did care about being alive to see my grandkids. I did care about dressing with attention to my clothes and style. I did care about being healthy. That was the jumpstart I needed and began my continuing journey. 2. CHANGE WHAT YOU CAN NOW. I didn’t gain an extra 100 pounds over night. That came about over 17 years of marriage, kids, vacations, holidays, and jobs where I sat down 80% of the time. The first step to losing weight was to change what I could change today. For me, that meant admitting I was extremely overweight and going through my closet. My clothes looked badly on me, so wearing them made me feel badly about myself. And when I felt badly about myself, I would not have the motivation to change anything. I cleaned out all the clothes that, truthfully, hadn’t fit in years. I went to the thrift stores and replaced them with clothes that were right-sized (embarrassing as it may have been to admit), and went to a few helpful websites that helped me clearly identify the look and style I was going to emulate. I liked what I saw in the mirror for the first time in years. I felt confident when I went to work, because people saw me differently. As I gained confidence, it gave me the courage to take the next step. 3. MAKE ONE DRASTIC CHANGE. I also knew I had to make a big change that would shake me up. I didn’t give up chocolate or pasta or become a salad-eating disciple of vegetarianism. I wasn’t ready to give up Diet Coke at that point, either. But I needed a shock to my system that would signal the “new” me, the new direction I was determined to take for myself. So I grew a beard. I’ve never had facial hair, so this was a visual sign that I was making a big change. It helped give definition to my chubby face, and when I started seeing what looked like a chin, I began to get even more motivated. The drastic change I’m suggesting here doesn’t have to be food-related. So often when we begin to think of losing weight, we think of all the stuff we will lose. I chose to make a big change and gained something. This was motivational because the “new” me already dressed different, and now I was beginning to look different. 4. FORGET LOSING WEIGHT. If you decide to lose weight and make it about losing weight, you’ll never lose weight. Wow, that sounds redundant, right? The trouble with diets or a focus on weight loss is that it’s about losing something. Yes, I wanted to lose the giant inner tube around my gut, but if I did that, I’d lose ice cream. I’d lose Diet Coke (a huge loss for me, as I would drink several each day). I’d lose cookies and French Fries. My incredibly intelligent wife (remember, she asked the all-important question that started this whole thing) gave me a great bit of insight: “Just be healthy.” That simple mindset was so freeing! So as I started losing weight, I stopped thinking about losing weight and started thinking about being healthy. I didn’t begin reading fitness blogs or working out each day, I didn’t start eating kale and tofu. I just asked myself, “Is this a healthy choice?” If the answer was no, then I tried not to do it. 5. DRINK WATER. This is probably one of the most important things I’ve done along the way. I’m a huge fan of Diet Coke and during busy times at work, I could drink three or four 16 oz. bottles each day. Every time I went out to eat, I’d get a DC and make sure I got every free refill I could. It was my “go to” drink. Asking myself the question “Is this healthy” about drinking that much Diet Coke inevitably led to the answer, “No” A healthy replacement wasn’t going to be a different kind of soda, so I had to decide to drink water instead. Beyond the health concerns of diet soda (which were not motivational to me at all), there are many obvious good reasons why drinking water is always a good idea. I started carrying a tumbler full of water with me everywhere I went, refilling it as often as it was emptied. It was the first thing I did when I got up, and it was the last thing I did before I went to bed (I keep a tumbler full of water on the nightstand all night long). Now, drinking water is as much a part of the “new” me as eating healthy, having a beard, and dressing better. You’ll notice that not one of these five steps involves a diet or exercise plan. Dieting and exercise won’t do anything if you don’t start with these steps. Cutting out sugar and carbs and walking 10,000 steps every day won’t matter if you still haven’t decided to care. These five steps are what started my journey–which eventually did include a change in my diet, lots more exercise, and a few other steps–but we’ll get to those at a later date. Start here, and eventually, you’ll get to where you want to be! If it worked for me, maybe it will work for you–or at least give you an idea of where to start!